You can find antique plates at many antique stores, online websites or auctions or through individual antique dealers and collectors. Several different manufactures, including Lenox, Royal Worchester and others, in several different countries made antique plates that ranged in style from plain to elaborately decorated. As with many antiques, it can be difficult to price antique plates, but a few guidelines can help. Locate and identify the maker’s mark on the antique plate. From the 18th century onward, factories used unique marks to identify their work. You can find many marks on the back of the plate. Once you have found the mark, find out what manufacturer made the plate, if it isn’t immediately evident from the mark, as some marks are symbols or letters instead of the company name. There are references online at websites like Marks4Antiques.com to help you identify the marks. This will help establish a value for the plate because plates by certain companies have a higher market value than others. Reference books can help price different plates by different manufacturers. Evaluate the attribution of the plate, which includes how indicative the plate is of the styles, colors and materials in use at the time of production. 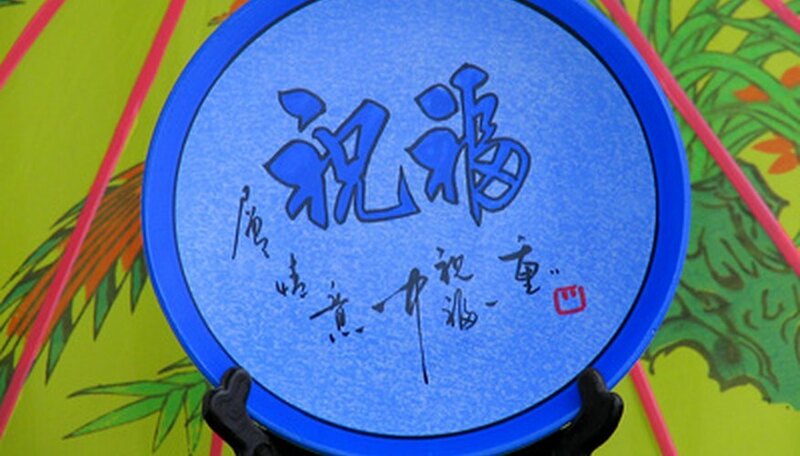 If a plate has rare colors or designs, the price will go much higher. A good place to learn about the history of a plate is a reference book, which provides detailed information about the history, company background and estimated market value of the item. You can purchase reference books online or at a local bookstore or borrow them from a local library. One example of a reference book is “Antique Trader Pottery & Porcelain Ceramics Price Guide” by Kyle Husfloen. Find out if the plate has provenance, which means the plate has documents proving prior ownership. This information can include who gave or purchased the plate to whom, what date and whether generations have passed down the plate. Provenance will increase the value of a plate, and provenance of royalty or prestigious individuals through history greatly improves the price of an antique plate. Evaluate the general condition of the plate. Chipped, worn, stained or damaged plates will have less value than plates that are in good to mint condition. In addition, if the plate is part of a hard-to-find collection by a company (for example, holiday dishes from a particular year), the price of the plate will go up, especially if the plate is in good condition. Look at online auctions, antique stores, collector’s shows and even garage sales to see the current market value of similar plates. This will give you a good idea of the correct range to price the antique plate. Take the plate to an antique dealer, preferably one knowledgeable about antique plates, for an appraisal. What are Currier & Ives Plates' Values?